Undoubtedly one of the most charismatic cities in all of South America has got to be Cuzco, Peru, once the capital of the Inca empire. In the Indian language of Quechua, Cuzco means “navel,” and at one time the natives believed that Cuzco was situated in the exact center of the world. Arriving in the city, we were instantly struck by Cuzco’s enchanting personality. Few places have the ability to charm so quickly, but Cuzco is unique and It immediately won our affections. For two weeks we were prisoners of the magical spell of this old Inca citadel. The heart of the small city (120,000 people) Is the Plaza de Armas. This attractive square is rich In history, for it is in this plaza where the decisive turning point of the fall of the Inca empire took place. In 1833, the Spanish conquistador Francisco Pizarro betrayed the Inca ruler Atahualpa by executing him where the church of Santo Domingo now stands. Cuzco still boasts amazingly well-preserved masonry which is the original stonework built by the skilled Inca artisans. One Just can’t believe how perfect those ancient masons pieced together huge chiseled rocks with such mathematical precision that nothing was needed to hold it together. Other less important walls were constructed by haphazardly placing different sized stones together and filling in the spaces with mud. The result was as coherent and appealing a pattern as a patchwork quilt. Ordinarily we don’t go around observing wall formations, but the ancient Inca stonework was too amazing to ignore. One day when we were strolling through Calle Triunfo, a narrow alleyway in Cuzco renowned for Its impeccable stone walls (Including the well-known carved stone of 12 angles), we came upon a sight that left us transfixed with wonder. Two decrepit street musicians, one blind, the other legless, were playing their instruments to an audience that included only the two of us. The stocky blind man, wearing almost surrealistic pink sunglasses, plucked away on a battered harp. His little partner played a steel flute, and like the blind man’s, his hollow eyes never changed direction. pair preferred the mystical setting of Calle Triunfo to the more populated Plaza de Armas which could have earned them more money. Their native music was beautiful In its simplicity and close resemblance to the hypnotic music of the Orient. We stood there awed by the bewitching sounds echoing against the stone walls, feeling profound compassion for two handicapped individuals endowed with a talent for creating beauty. Just outside Cuzco, within walking distance, is the ruined fortress of Sacsahuaman. Three huge walls run parallel, yet In a zigzag fashion, for more than 360 meters. Every Inca wall inclines perfectly toward the center, from top to bottom. This design is supposedly earthquake proof. All corners are smoothly rounded, but ironically with all these circular finishes to the hard rock walls, the Incas were oblivious to arches. Instead, ail doors, entrances and niches in walls are squared. Sitting on top of the fortress, we admired the precision of the stonework. The walls markedly resemble huge Jigsaw puzzles. We were amazed at the perfect engineering feats they accomplished with their primitive implements. At the foot of the fortress roam numerous llamas with black, brown or white fur. The animals are so docile we were able to walk near them, but not close enough for petting. When we saw llamas in Chicago zoos, they weren’t that striking. But grazing freely in their native territory with the ancient ruins in the background, the Peruvian llamas presented a lovely scene. Included in the admission to Sacsahuaman are visits to the Temple of the Sun at Kkenkko (Quenco in Spanish). We descended into a large cave. In the middle Is a huge flat stone big enough for a person to lie on. Presumably the subterranean room was used for sacrificial purposes. 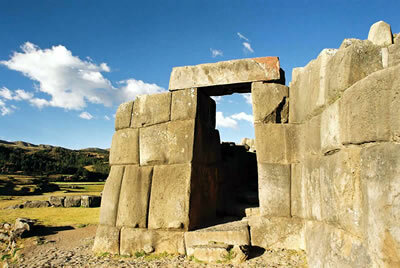 Further on is another Inca fortress called Puka Pukara. Perhaps It was installed to guard the nearby baths at Tambo Machay. Tambo in the Quechua vocabulary refers to a resting place along an Inca route, sort of like truck stops. Tarmbos offered food, drink and rest from the rigors of traveling on foot in rugged Andean terrain, and centuries later the Tambo at Machay served its original purpose for us, two weary hikers. Cuzco rests in a valley at 3,500 meters above sea level. To reach the surrounding ruins, we had to climb towering hills. We discovered it’s no myth that altitude markedly affects one’s breathing. We were forced to move slower, take frequent rests and at times experienced difficulty in digesting food. Despite two weeks to acclimatize ourselves, we never fully adapted to those tremendous heights. It was a distance of three miles between Sacsahuaman and Tambo Machay and in between the ruins, we found scattered adobe huts inhabited by Indian families. Most of these people were farmers and since we were walking we had the opportunity to stop and observe them at work. A group of five or six peasants (including women) were necessary to cultivate the soil. They were using tools Identical to those archaeologists describe ancient Indians as using. A wooden apparatus with a steel curved blade on the end is still used by the natives to turn the earth by hand. Two farmers wielding the crude instruments would simultaneously one…two…three dig into the soil working on the same row. They were followed by another peasant carrying a sack of seeds and depositing them in the earth upturned by the dual diggers. This tedious method of farming wasn’t helped by the steep incline of the hill they were cultivating. Potatoes seem to be the primary crop which is not surprising since the potato is indigenous to this area. The “papa,” as it’s called here, is one of the few crops able to withstand the high altitude and rocky terrain of the Cuzco area. Indiana farmers can’t imagine how easy their work is in comparison to all the energy Peruvian farmers must devote to their land and the meager results these peasants receive. We spent the entire day exploring the ruins on the outskirts of Cuzco. By the time we arrived back in the city, it was approaching dusk and thus getting cool. Cuzco’s weather is such that if you stand under the hot sun in the day, you sweat. Move several paces to shade and you shiver. So with no sun the nights get really brisk.